This is a sponsored post written by me on behalf of Green Works. All opinions are 100% mine. April was Earth Month, but we can do things that make a difference all year long! Both things that make a difference in your world and in your health. Here are 7 ways to celebrate Earth Month, while getting healthier at the same time. I don’t know about you, but when I think about Earth Month what automatically comes to my mind is recycling, planting a tree and using fewer products that fill up our landmines. While those are all phenomenal things to do, looking after your health and well-being has benefits for the Earth as well. Plus, it helps you to get healthier. I sat down to brainstorm ways our family could celebrate Earth Month now that also would have an immediate effect on our health. I love two things about this list: 1) These are win-win things we can do for our planet and ourselves and 2) These are things we can take with us beyond just Earth Month. I could write one very lengthy article about all of the reasons we should stop buying our water in plastic, but I’ll make this brief and focus just on the health benefits. Our family switched from plastic water bottles to reusable ones at the beginning of last school year. 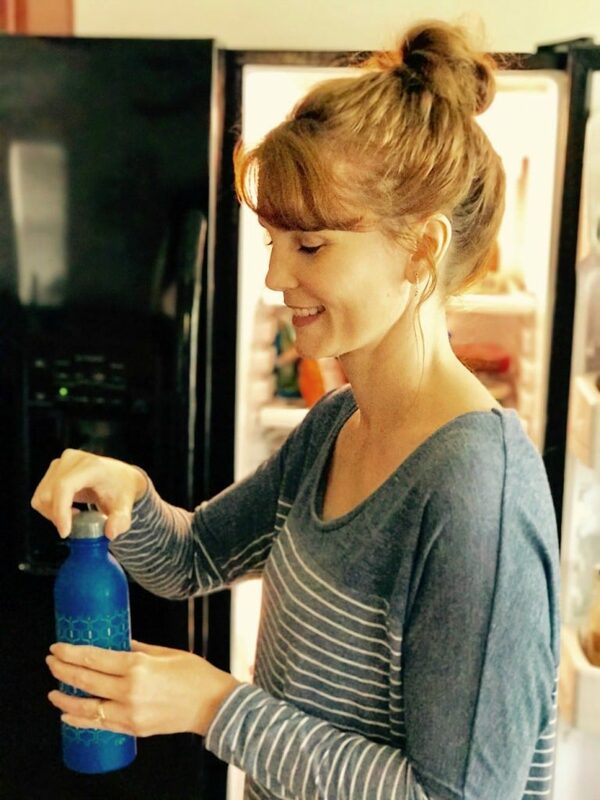 Yes, I used to send those mini plastic water bottles in my kids’ lunches, plus we used to keep them in the refrigerator so we could grab and go. When I added up the number of plastic water bottles we were using, it was down-right embarrassing. We knew we needed to make a change for our planet, our health, and our pocket book! Not only have we started drinking more water since switching to reusable water bottles, which in and of itself is a health benefit, but we started saving quite a bit of money every month by not purchasing plastic. Win-win. Our area has an abundance of farmers markets we weren’t utilizing. So we started getting out a couple of Saturdays a month and shopping for our produce this way. Not only did it get us out and walking (hello exercise! ), but we knew we were buying quality produce that was good for us while helping our local economy at the same time. Again, win-win! In our home, we have 2 1/2 bathrooms, a large kitchen, lots of appliances to wipe down and four people who live life at home. My husband and I both work from our home too, so we are at home A LOT. Which means a lot of cleaning! 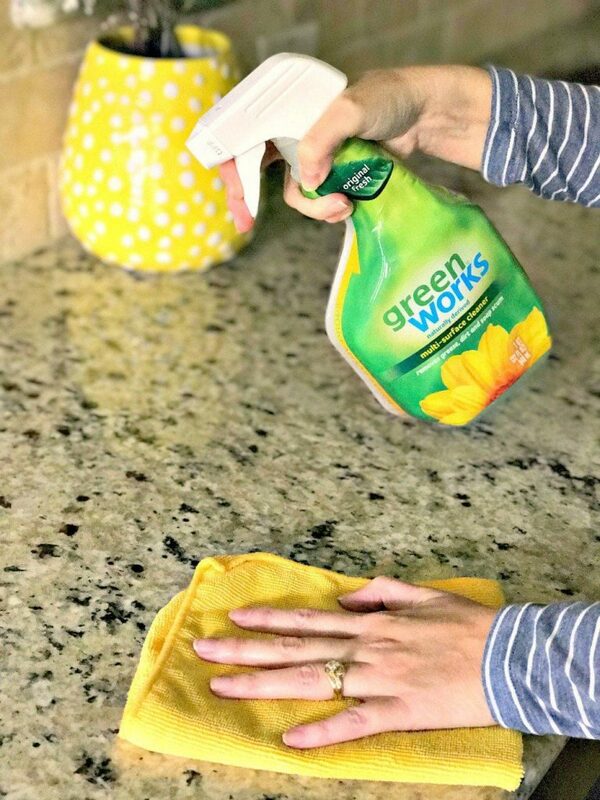 We recently spent time getting our home ready to sell which meant constantly wiping down counters, bathrooms and any flat surface that could get dusty. On another note, we’re about to move into an RV for a year while we travel. I’ve heard from other full-time travelers that there are times you feel like you’re cleaning all.the.time. Needless to say, switching to cleaning supplies with the least amount of chemicals would make an immediate impact on our health. So we did. 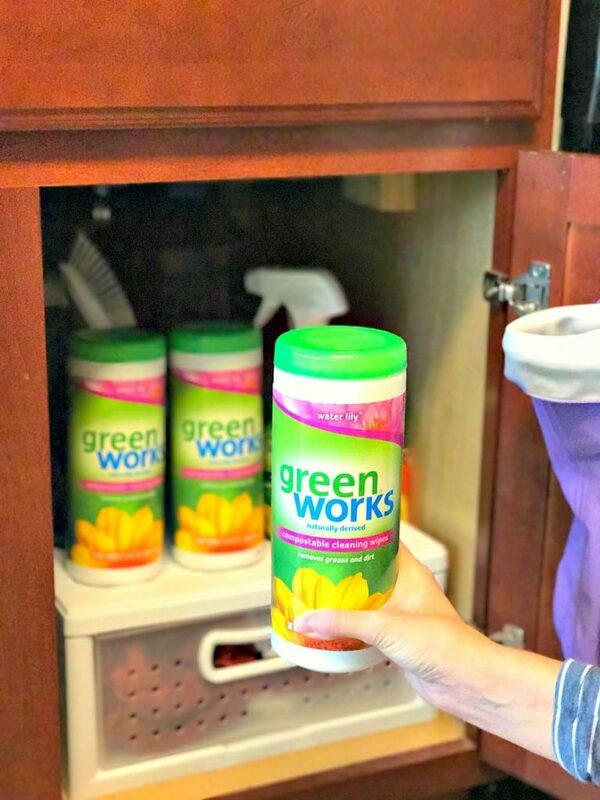 Have you heard of Green Works products? I’m a new user to the brand and saw them at our local Target on sale. At the time I shopped there, they were buy three get one free. Score! Plus, I could Save at Target with Cartwheel. So I stocked up! 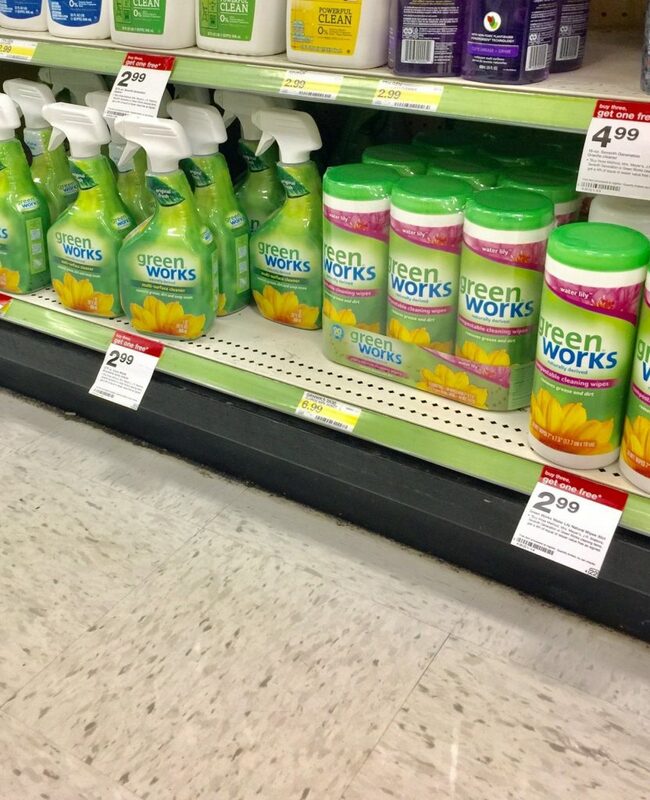 Green Works products are derived from at least 97% natural ingredients. The wipes are compostable and safe to use on multiple surfaces in your home. The all purpose cleaner helps remove grime, dirt, and grease on multiple surfaces around the home and leaves no harsh chemical residue. The products are also not tested on animals, which I’ve been focusing on and educating myself more about lately. I have always dreamed of going out into my backyard and gathering fresh produce for dinner. I even planted one with the help of family in our home in Colorado many years ago. I quickly found out that running a home, running a business and getting kids to where they needed to be made me have to put gardening on the back burner. I just didn’t have the time to take care of a garden like it needed. Recently one of my kids asked if we could have a small herb garden. I cook with quite a bit of fresh herbs and not only do they go bad quickly, they can be pricey. So, we’re going to try planting a few herbs in pots and keep them in the kitchen. This is the kind of ‘garden’ I have time for and can maintain. I’ve already been dreaming up the dishes I’m going to cook! 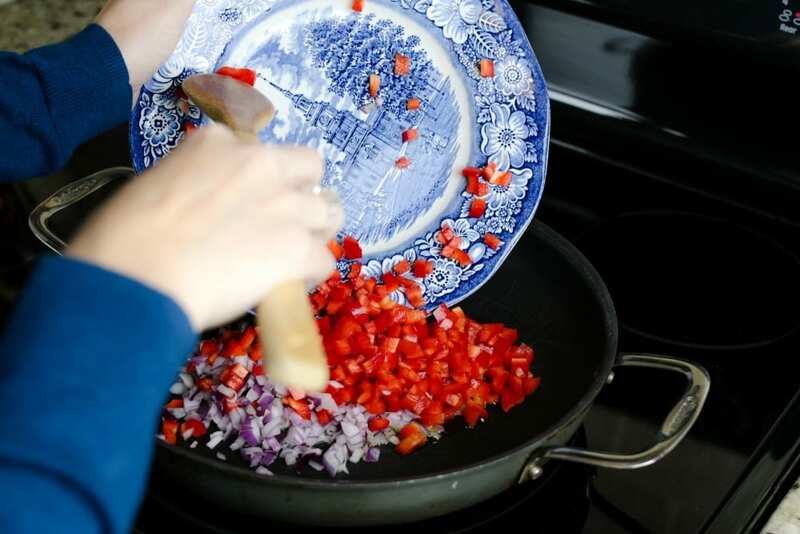 Making an effort to eat at home more has so many benefits. 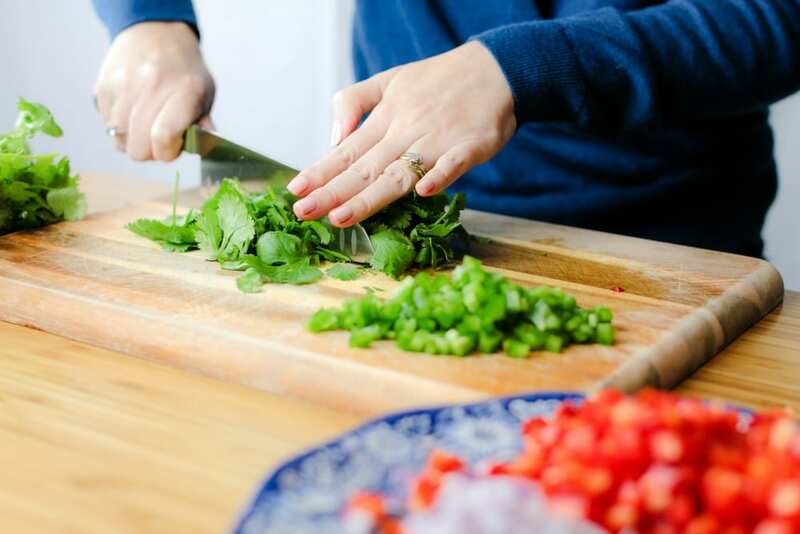 From more family time, better for you meals and learning to get better at the skill of cooking. Now I know you are one busy woman and cooking at home all the time might send you over the edge. I LOVE to eat out and got into a rut of not cooking much. Because of that, our budget went out the door and I just didn’t feel good overall. So, I made a plan and set some guidelines for making meal planning and cooking at home easier on myself. I started using a grocery delivery service which made whipping up a meal plan more enjoyable. While someone else is shopping for my groceries, I’m busy getting the pantry and refrigerator organized and prepped for new ingredients. The extra cost is worth it to me in the long run. I choose recipes with very few ingredients, but ingredients that have loads of flavor. Every week doesn’t go perfectly as planned, but we now rarely eat out and when we do, it’s truly a treat. This is a hard one for us because we live too far away from anything to walk to it. Even the convenience store across the street requires crossing a busy highway where people are traveling at speeds of 60 and more. No thank you. But there were little ways within our neighborhood that we could choose to walk instead of drive, which although small, makes an impact on our environment and health. Instead of driving to the mailbox, we walk. Instead of driving to the park we walk. Instead of driving to our local gym, we canceled our membership and get our exercise at home. And when I say exercise at home, I mean a simple walk or jog around the neighborhood or using a 7-minute exercise app. Anything else too difficult and we wouldn’t follow through! Spring time is all about decluttering and cleaning, so as you’re going through your closets and garages, think about what items you could recycle by donating them. Find out what your local women’s shelter’s needs are. Or call up a local charity you care about and ask what they’re in need of. Take a load of items to a donation center, or church. There are so many organizations that need your help. By recycling your items, you’re not only helping them out, but it makes you feel amazing. Giving back is good for your mental health. Did you and your family celebrate Earth Month? If so, share with me some ways you like to make a difference. Next articleHow to Wear White Jeans in Summer + Outfit Ideas to Copy!